I’m chilling at Terrapin Crossroads. Southern Pan-fried Chicken with a microbrew, followed by a set of music pheaturing Phil. new Robert Caro out today! Finally listened t 8/7/82. That Music -> Sugaree -> Music sandwich satisfied me immensely. 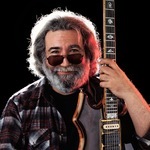 Are there any HQ picks of Jerry raising his fist? I wanna get a tattoo of it. That’s exactly what I want. Underneath I want "I Will Survive" written.